October | 2012 | Can't Believe It's Allergy Free! I have had many requests for Indian recipes. While many Indian foods are gluten and allergy free, there are many others which have to be excluded from the gluten free diet. For anyone allergic to gluten, the chapati / paratha / puri is by far the most missed item in an Indian meal. The chapati is also great substitute for the Mexican tortilla especially if corn is an allergy issue. Just substitute tapioca or potato starch for corn starch in my Gluten Free flour Mix recipe, which is right below the Start Here, at the beginning of my blog. You will also find it in the Basics, or Cakes. Cookies and Desserts section. Try the gluten free chapati / tortilla and see how soft and pliable chapatis remain long after they are made. Serve them hot off the tava (skillet), or store them in an insulated container for later use, or even freeze them, then microwave and serve. They are perfect to take along on a journey, rolled up with a favorite filling– anything from small pieces of chicken or paneer tikkas, aloo subzi, to sweet fillings like ghee and jaggery paste or strawberry jam can go in the chapati roll. They are simply great for school lunch as well. Call them tortillas and make quesadillas with Mexican fillings, or prepare enchiladas with them. Fold them like wraps with salad/ cold meats, leftover cooked meats. Or make quick and easy roll ups for hungry kids in a hurry. 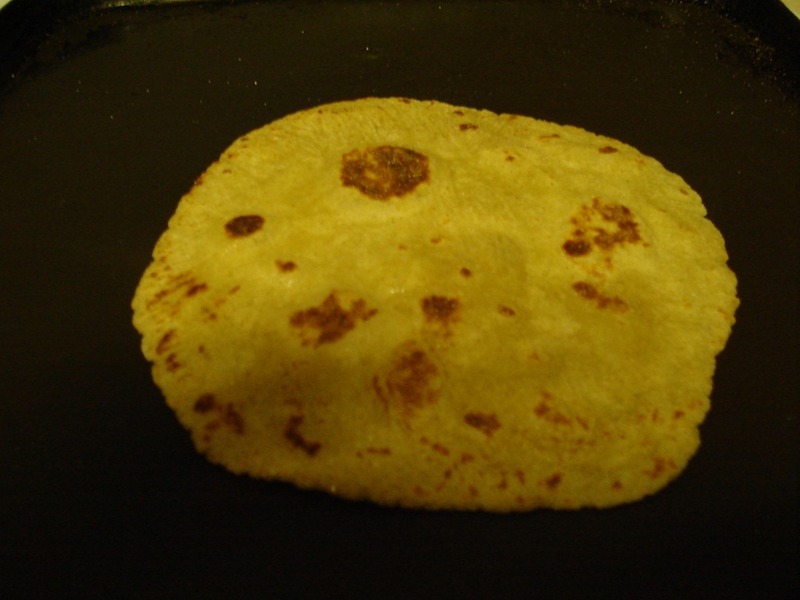 1 Tablespoons or a little more, of oil or ghee for smearing on the pan or on the chapati./ tortilla. Place flour mix in a large bowl, with mashed potato and 1 Tablespoon oil. Rub the potato and oil into the flour to incorporate well. Add half the water and start to knead the dough. Slowly add the remaining water (as needed), kneading all the time. Note: Gluten free flours usually require more kneading than wheat flour to acquire a soft, smooth texture. Add a little more water if required. When you are able to form the dough into a ball, smear your hand with a little oil and continue to knead to make a smooth dough. Place prepared dough in a bowl, cover and allow it to rest for about 15 minutes. Place the rice flour and corn starch mixture onto a plate and keep it at hand. Tear off two large sheets of plastic wrap, about 10” long Place one sheet on rolling surface and the other on any clean, dry surface nearby. Take care to ensure that plastic sheets are not close to stove top. Heat a tawa / skillet on medium- high heat, till well heated. Divide dough into 10- 12 equal sized balls. Roll each ball smoothly with your hands, press and flatten to form a disc. Take one flattened ball and dust it lightly with the flour mix kept on plate. Place on top of plastic sheet kept on rolling surface. Place the second plastic sheet on top of the ball, in parallel with the bottom sheet. Roll out gently, rolling evenly on all sides, to form a fairly thin circle of dough about 7” in diameter. Once rolled out, remove upper plastic sheet and set aside away from stove top. 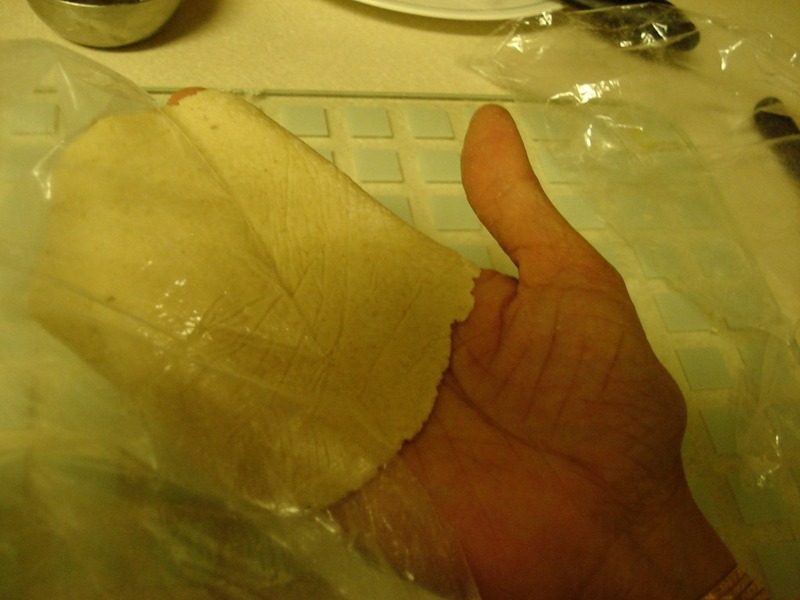 Flip the chapati / tortilla along with the lower plastic sheet onto the palm of your hand. 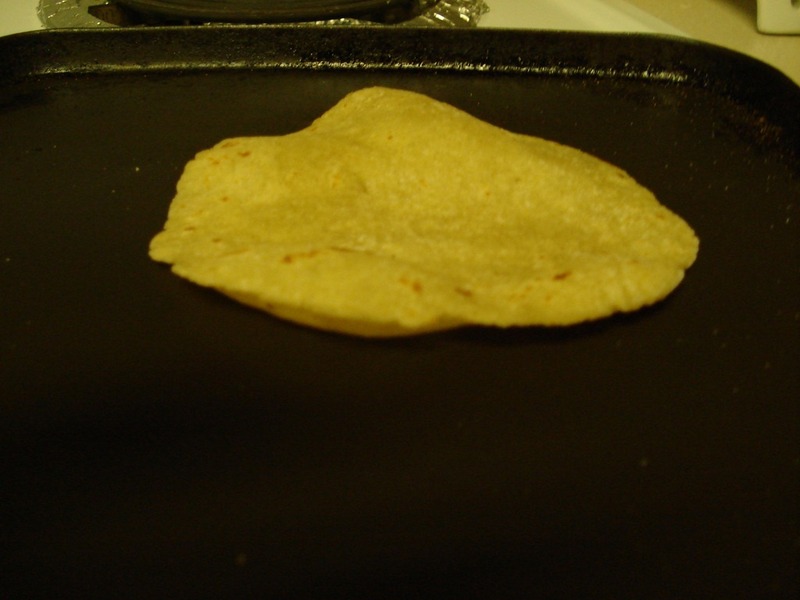 Allow some bubbles to appear, then, using a spatula, flip roti onto the other side and allow it to cook while pressing it gently and moving it around the tawa / skillet a little. Flip once again and let the first side cook a little more. Remove from skillet, smear with ghee and serve hot, or keep in insulated container till all chapatis are are made, and then serve. Make Gluten Free Flour parathas just as you would make wheat parathas. Make a hollow in the ball of dough,place your filling, then lift up all sides and close them so that filling is firmly enclosed within. Gently press the filled ball, dust with dry flour mix, place on plastic wrap and roll out without pressing too hard with the rolling pin. Puris can be made without adding the boiled and mashed potato. 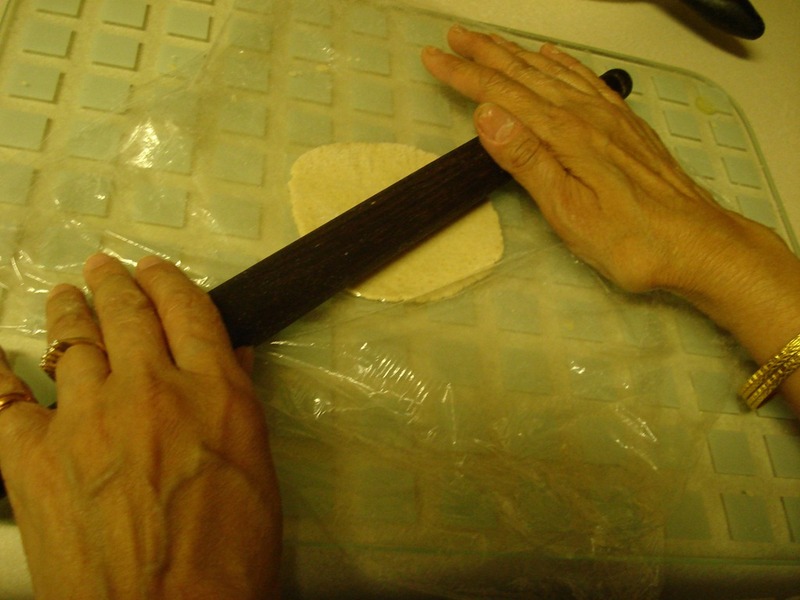 Since puris don’t have to be large or thin, you may be able to make them without using the plastic wrap. Instead of mashed potato, use 3 Tablespoons of soft cooked dal for one cup of Gluten Free flour I use moong dal, but you could try any other dal of your choice. Dal should be of cake batter consistency. You may need an extra Tablespoon if the consistency is too thin. Add dal to flour, mix it in, then add water as required. The amount of water you need depends on the consistency of dal, so add water a little at at a time. Cook 1/2 cup dal with a 1//4 teaspoon of turmeric and salt to taste. Hing (asafoetida) is optional. Fill it into ice cube trays, and freeze. 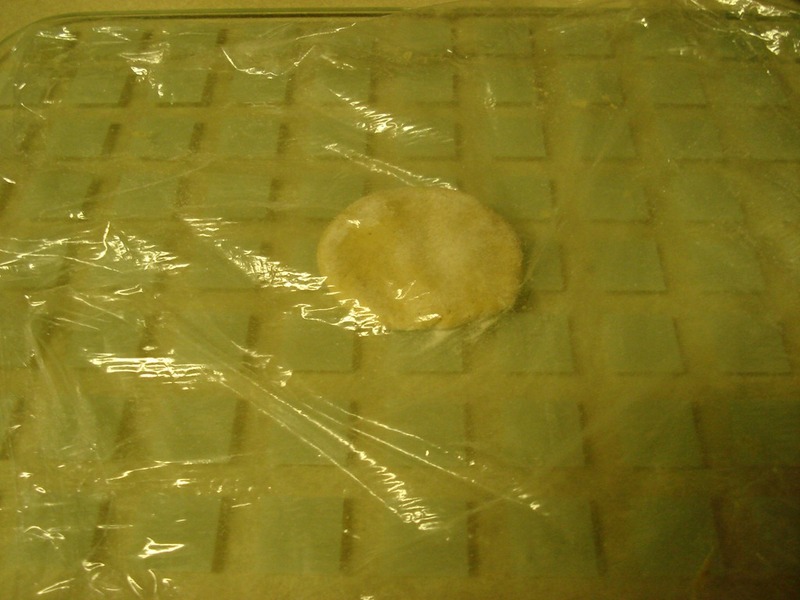 Remove frozen dal cubes from trays, put into in freezer bags, and place in freezer. This way, you will have cooked dal handy before preparing the chapati / tortilla dough.